As much as I would love to waltz into Sephora and buy one of everything, I unfortunately exercise a fair amount of restraint when buying beauty products. I do research, ask questions, and look to beauty blogger reviews before I drop $20 on eyeliner or $45 on foundation. 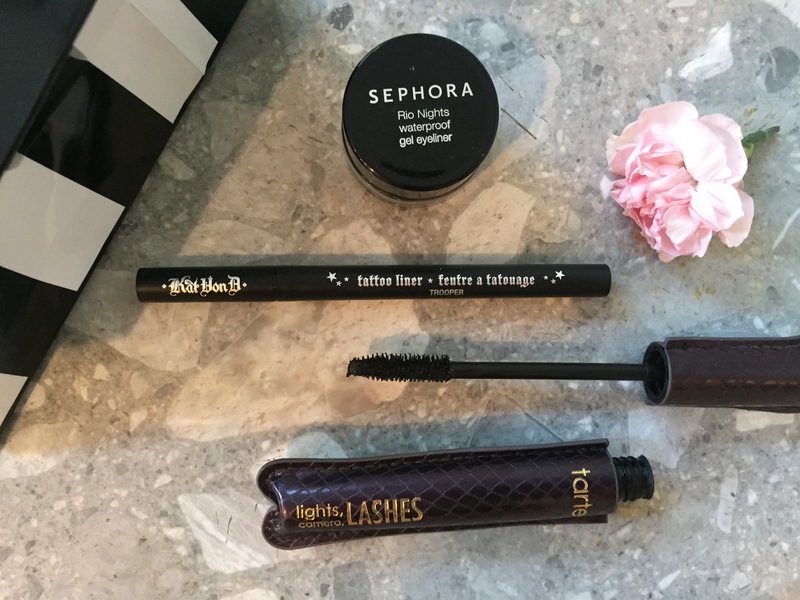 Recently I’ve amassed quite a few eye products, and on a whole I’ve been happy with all of them, so I compiled a short list for anyone else whose to-do list includes hitting up Sephora! Rio Nights Waterproof Gel Eyeliner (Sephora): I’ve had my old cream/gel liner from Clinique for at least three years now, and while it’s still going strong, I knew it was time to retire it. You should be throwing out eyeliner after a year, at the latest, so me keeping it for ages was a probably a bad call (but props to Clinique for making such a great product!). While this Sephora brand gel liner isn’t quite as creamy as my old one, on a whole I’m happy with the product, especially since I got it on clearance for about $3. I do prefer liquid formulas to gel, because liquid liner stays better, but I like to have a few different liner options in case I want to mix it up. Lights, Camera Lashes Mascara (Tarte): My mom actually picked this up for me for my birthday, and I’m a huge fan. I like my lashes with lots of length and volume, and this mascara delivers! I’m also a fan of the Covergirl LashBlast Volume, which gives a similar effect. However, I like the Tarte brush better and you can’t beat that adorable packaging! Tattoo Liner (Kat Von D): As a cat-eye liner devotee, I take my liquid liners pretty seriously. It has to be precise, with a smooth application, and last the whole day without budging. Previously I had been using a Revlon ColorStay liquid liner, and while it’s a decent budget buy it was really time for an upgrade. I was torn between this eyeliner and the Stila one, but the Sephora saleswoman strongly recommended this one (and her cat-eye game was on point, so I trusted her). I am so impressed with this liner; application is a dream and I seriously think I could sleep with it on and it would still look perfect.